Well, I'm pleased to say that I finally finished Uncle Tom's Cabin by Harriet Beecher Stowe. I have always wanted to read this book given its status as an American classic, and that the author was considered to be the first 'serious' female American author. 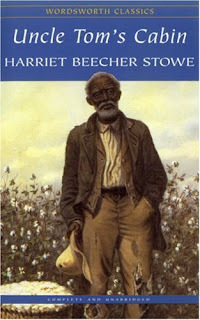 The novel was published in 1852 and addresses the issue of slavery in such a confronting and raw way that it would have been very difficult to ignore in its time. I must admit that I struggled to get through this one, as the dialogue of the characters is extremely authentic to the times and therefore difficult to follow. The subject matter is also quite heavy and religion is mentioned on almost every page. All in all, I can now see why this book is called a 'classic' and I'm really glad I persisted and finished it. Would I recommend it? That's difficult to say... if you like to challenge yourself every now and again by reading a classic (like I do) then sure, this is worth it.